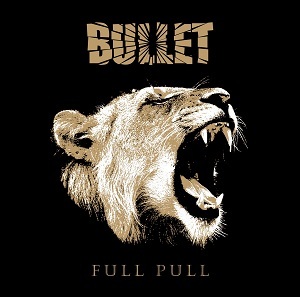 Bullet are a heavy metal band from Växjö in Sweden. They released their debut album "Heading for the top" in 2006, and followed this with "Bite the Bullet" (2008) and "Highway pirates" (2011). Now they are back with their fourth album, "Full pull". The band have played plenty of their own shows and also done shows with Sabaton and Hammerfall, and had the pleasure of being the opening band when AC/DC played Gothenburg to a crowd of 50,000 fans. Listening to the album, it's clear that AC/DC are a big influence on them musically, but vocally Hell Hofer's voice reminds me more of Britny Fox. The vocals and music certainly work well together and the album has masses of power as a result It's an impressively good album - when you realise you've actually listened to it 6 times in rapid succession and still want to hear more, then you know it's good stuff. If you're a fan of AC/DC and proper heavy metal bands such as Judas Priest and Saxon then this album is going to be right up your street.